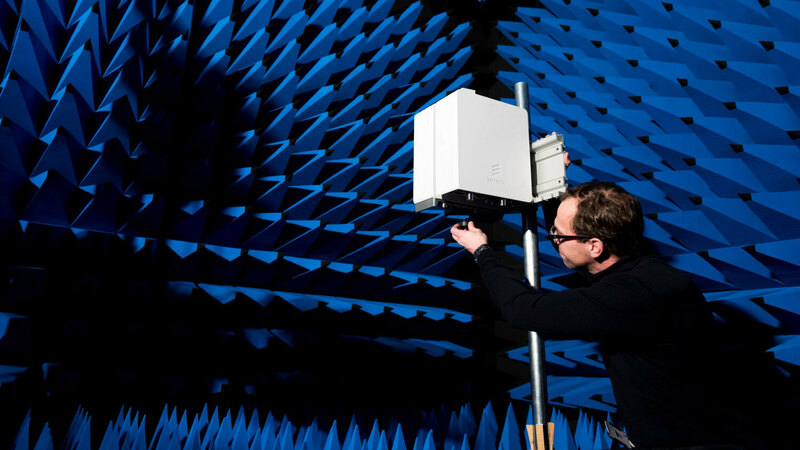 Ericsson announced on Friday that it has teamed with Deutsche Telekom to demonstrate a 40 Gbps mmWave wireless transmission link with sub 100-microsecond latency. Ericsson said the test took place at the Deutsche Telekom Service Center in Athens. The test used millimeter wave (E-band) spectrum for transmission over a distance of 1.4 kilometers. The round-trip latency performance of the link tested was less than 100 microseconds, which confirmed the positive contribution of wireless backhaul technologies to satisfy network-specific latency targets. Ericsson has a five-year contract with Deutsche Telekom, which kicked off in December 2017. Ericsson’s senior VP Arun Bansal says that they can deliver a 5G network in that time frame. “We listened to Deutsche Telekom and understood their urgency to have 5G-ready infrastructure in order to stay at the forefront.” They’ll run 4G on their 5G hardware until it is installed across the entire network, then they’ll launch 5G with the flip of a switch sometime in the next few years. Technical setup included the use of Ericsson’s latest mobile transport technology including Ericsson’s MINI-LINK 6352 microwave solution and Router 6000. Separately, Ericsson and Qualcomm Technologies, Inc., a subsidiary of Qualcomm Incorporated, have achieved a non-standalone (NSA) 5G New Radio (NR) data call on 2.6 GHz, adding a new frequency band to those successfully tested for commercial deployment. This entry was posted in Microwave Market, Wireless backhaul. Bookmark the permalink. The live trial, which was organised at the Deutsche Telekom Service Centre in Athens, is a breakthrough moment in the evolution from today’s 10Gbps reality toward the 100Gbps future. It was arranged over a hop distance of 1.4 kilometres in the millimetre wave (E-band) spectrum, which included a technical setup consisting Ericsson’s latest mobile transport technology including Ericsson’s MINI-LINK 6352 microwave solution and Router 6000. During the trial, the focus was also on the stricter latency requirements in the 5G network architecture to support low latency or ultra-low latency use cases. The round-trip latency performance of the link tested was less than 100 microseconds, confirming the positive contribution of wireless backhaul technologies to satisfy network-specific latency targets. Last November, Deutsche Telekom worked with Ericsson in offering campus network solutions to its industry customers based on a dual slice approach that combines and integrates public and private LTE connectivity that is often enhanced with a local edge cloud deployment. Deutsche Telekom, along with OSRAM, is making prototypes and testing mobile robotics solution at the latter’s factory in Schwabmünchen, which will receive system technology from Ericsson for indoor factory coverage and local core network. The global satellite backhaul market is expected to reach over $32 billion in revenue by 2028, with 5G supporting one third of the overall market, according a new report released from NSR. According to the report, mobile wireless backhaul is the largest opportunity in this space, as satcom becomes a mainstream solution and 5G opens opportunities for satellite to seamlessly integrate with the global telecom ecosystem. Trunking also appears to be re-born via lower capacity costs and slowdown in fiber expansion, while hybrid networks represent a long-term play for emerging OTT content distribution models, the research firm said. The direct impact of 5G in satcom won’t be seen before mid-2020s, but growth will be sizable, generating one of every three new dollars for backhaul capacity revenues through 2028. The ground segment has a key role to play in the integration of satcom into 5G, by responding to new performance requirements and making the solution transparent and easy to adopt for mobile operators. “The combination of competitively priced capacity with advanced ground segment makes satcom a relevant solution for mobile network operators continually seeking new sources of revenue and who are increasingly capex-conscious and risk-averse,” stated Lluc Palerm, NSR senior analyst and report author. Satcom can also find the upside of OTT in hybrid networks. NSR said satellite is still king for content broadcasting, and as content moves to the edge to support the explosion on IP Video and new formats like UHD and eventually VR/AR proliferate, satcom will emerge as a key tool in the ecosystem. Business models are evolving quickly, resulting in the increased demand for managed services. “With MNOs focusing on core services and minimizing capex exposure, managed services are the perfect match between satcom’s streamlined operations for remote areas and the MNOs need to continue expanding coverage profitably,” the research firm noted.